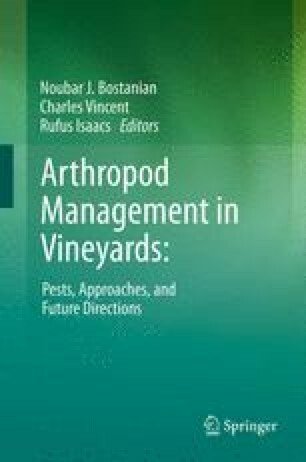 Several coleopteran foliar feeders are associated with grape in eastern North America. The most important of these is the JB, often responsible for extensive defoliation. This defoliation is very damaging to young vines. Mature vines can tolerate substantial foliar feeding by JB without affecting fruit yield or quality. Green June beetle causes similar foliar injury. The other species (grape flea beetle, rose chafer and grape rootworm) cause minor injury to foliage but cause more important injury on other plant parts (expanding primary buds, young clusters, and roots, respectively).